All the Churches in Hamilton co-operate on a number of projects. Hamilton Churches Together finances and runs a Drop In Centre, which provides advice and practical support to any in need. The Churches also finance the Jubilee Key Scheme. This is a guarantee scheme for people who are settling into private rented accommodation, and who may not be able to afford the initial deposit required by landlords. The clergy of all the Churches meet on a monthly basis from September until June. These meetings give the opportunity to share in prayer and worship, to discuss matters of mutual concern, to plan joint services and events, and to simply meet in fellowship and provide mutual support. During the Week of Prayer for Christian Unity in January of each year there is also a United Evening Service. Alternate years this coincides with the meeting of the Lanarkshire Society or Organists being held in Hamilton, and they provide the music for the service. 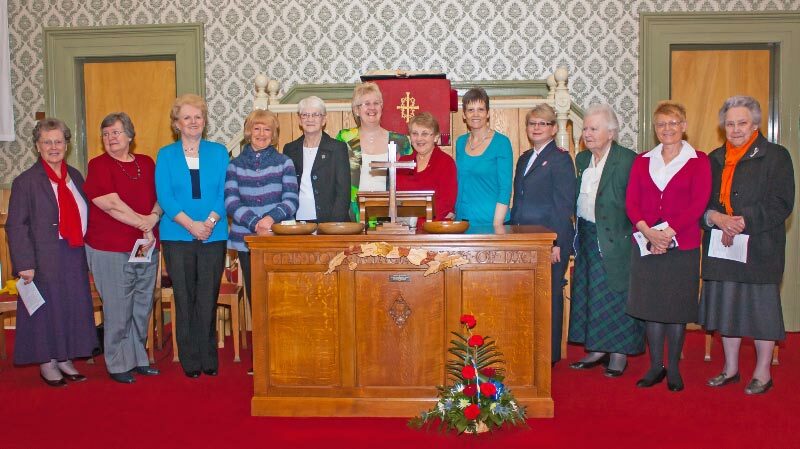 The ladies of the Churches organise the annual World Day of Prayer in March of each year. Services are held in local residential homes, and the day concludes with an Evening Service in one of the Churches, conducted by representatives of all the Churches in the area. On 1st March 2013 our church hosted the United Service for World Day of Prayer. Guest preacher was Cathie Corner, National President of the Women’s’ Union of the Scottish Synod of the United Reformed Church who linked the theme ‘I was a stranger and you welcomed me’ with the visual theme of colours in her address. The Churches located in the centre of Hamilton arrange a series of joint services during Holy Week. This starts with a United Evening Service on Palm Sunday when the Salvation Army band usually provides the music. Services are then held every evening, from Monday to Friday, when various clergy share in conducting the services and preaching the sermons. Each Church takes a turn in hosting these services. On Good Friday the clergy take a series of short meditations during a three hour vigil starting at 12:00, and concluding in a brief Communion Service at 3:00. This service is always hosted by St. John’s Church of Scotland. There are two early morning services at 6:30 on Easter morning. One is held in the Old Parish Church, and the other at Chatelherault Country Park, followed by breakfast in the Old Parish Church Halls. For Inter-Church Events see the Calendar in the Diary Section.